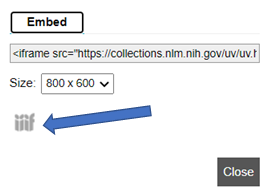 The "Book Viewer" (Figure 1) is accessed via the "View Book" or thumbnail links on the Resource Record page. Only one resource may be accessed at a time. 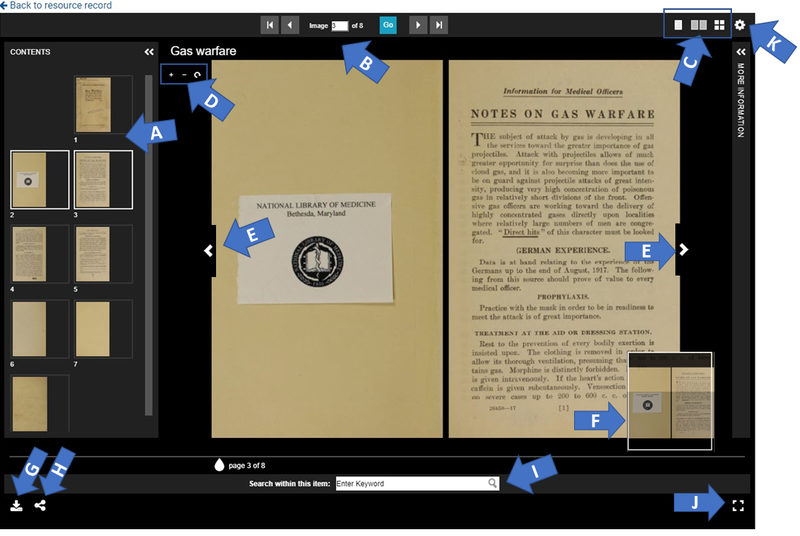 The "Book Viewer" includes various features and controls for exploring the resource. Figure 1: "Book Viewer" Interface. The top menu includes Download PDF/OCR (A), About this Book (B), Share this book (C), Zoom in and Out (D), Search Inside the Book (E). The top menu includes four features for exploring the resource; Download PDF/OCR, About this Book, Share this book, Zoom in and Out and Search Inside the Book. The "Download PDF/OCR " (Figure 2) appears at the top right of the navigation pane. When selected, 3 download formats appear: PDF, OCR, Metadata. The OCR and Metadata will open in a new window when selected. Figure 2: Download PDF/OCR provides download links to the resource as a PDF, the OCR, and the Metadata. You may download a complete copy of the resource's PDF by selecting PDF in Download PDF/OCR. See Downloading Resources for information on additional formats. If a PDF of the resource is available, it should automatically open in the Adobe® Reader in your browser window. Use the features in Adobe® Reader to view, save, or print the resource. You must install Adobe® Reader on your computer to access the PDF document. If you use Firefox as your Web browser and you cannot view the PDF, see View PDF files in Firefox without downloading them (Mozilla.org) or Using a PDF reader plug-in (Mozilla.org) for more information. About this Book provides a link to the book's resource record along with download formats: PDF, OCR, and Metadata. Figure 3: About this book includes links to the book's resource record and download links to PDF, OCR and Metadata. Share this Book provides embedabble links to either the current page view or book view. Share this Book also offers sharing of the resource via facebook, twitter, and email (Figure 4). Figure 4: Additional links to current page view or book view. Share resource via facebook, twitter, and email. The "Zoom In" and "Zoom Out" buttons allow you to minimize and maximize the size of the page image using the pre-defined zoom levels. Search queries are retrieved from the resource's uncorrected full-text generated by Optical Character Recognition (OCR) software. The search engine retrieves results related to queries for a single word or quoted phrases. 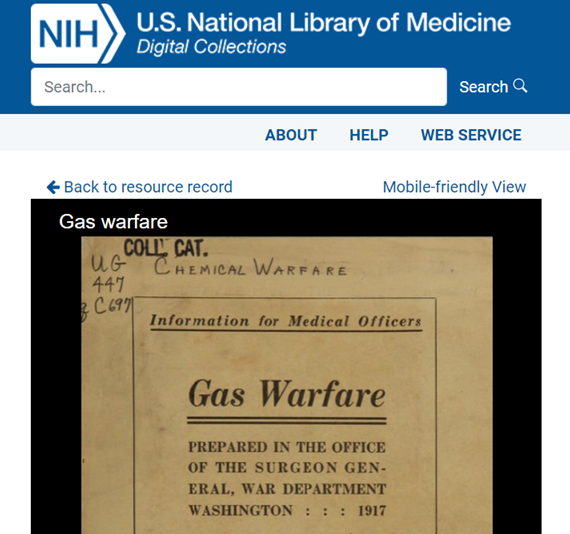 See Searching for how to search all of the resources in the Digital Collections and Searching Video Transcripts for how to search individual videos. For example, entering the term "nurse" will return "nurse" as well as "nursing", "nurses", and "Nurse's" (Figure 5). Entering a quoted phrase for "Nursing Service" will return results while the same phrase without quotes will only retrieve a result if there is an exact match. Queries without any results will include the statement "No matches were found." Retrieved results include the page number and a snippet with the search term in italics. Each result's snippet includes only the first instance of the term found on the page (Figure 5). Results are listed in order of relevance. When you select an orange marker, the resource will open to that page. Figure 5: Search Inside with results for the query operation. The bottom navigation pane (Figure 6) provides tools for exploring the resource. 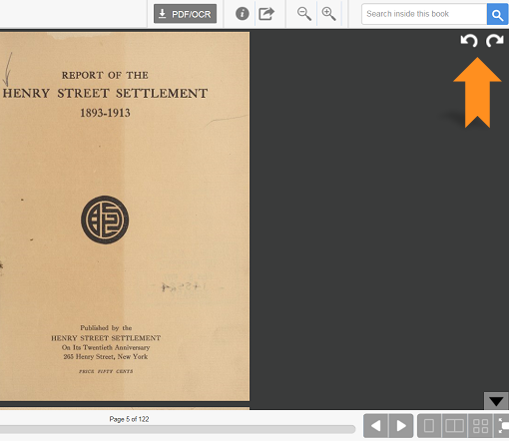 Figure 6: "Book Viewer" Thumbnail View . 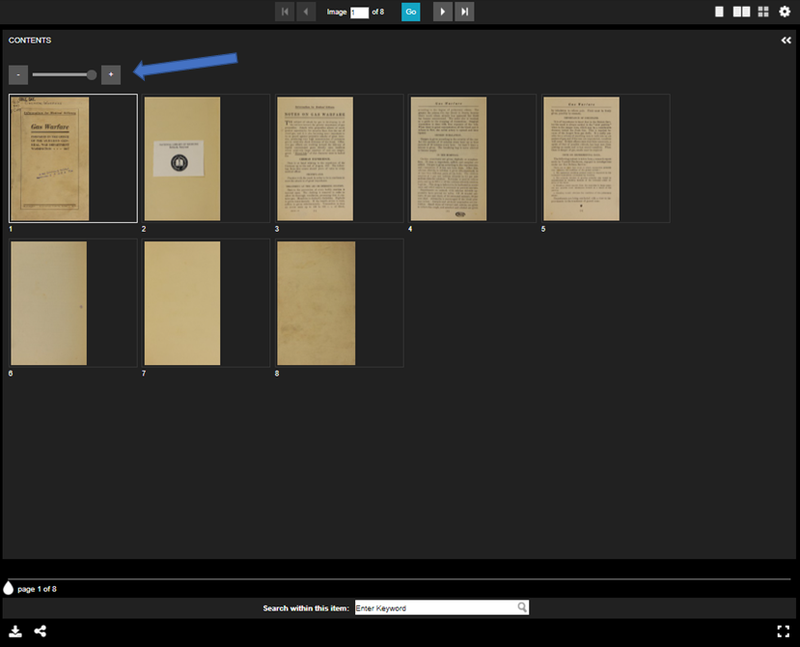 The bottom navigation pane includes the "Book Viewer's" scroll bar (A) with navigation arrows (B), display options (C), and hide navigation pane (D) . The bottom navigation pane includes 8 controls for exploring the resource's pages; Scroll Bar ,Flip Left/Flip Right, One Page View, Two Page View, Thumbnail View, and Full Screen View , and Hide Navigation Pane . The default setting is the "Two-Page" view. The "Scroll Bar" functions on one-page and two-page view. It allows to scroll effortlessly through one-page and turn the pages of two-page view. The "Flip Left" and "Flip Right" buttons allow you to scroll though the resources pages one at a time in any of the 3 page views (one page, two pages, and thumbnail view) minimize and maximize the size of the page image using the pre-defined zoom levels. The "Reset Zoom" button returns the page image to the original image size. The "One-page" button displays the image of an individual page. The "one-page " view may also be accessed by clicking a thumbnail image of a page to view it as a single page. Once "One-Page View" is selected, the rotate clockwise and counterclockwise buttons (Figure 7) appear in the top right corner. Figure 7: One-Page View displays the rotate function. The "Two-Page View" button displays the images of two pages side by side. The "Thumbnails" button displays the thumbnail images in a grid. The control buttons for roating clockwise and counterclockwise are deactivated while in the "Thumbnails" view. Each thumbnail includes the sequential page number. The default display setting is 100 thumbnails per page. The "Full Screen View" button displays the resource in full screen view. Both the top menu and bottom navigation pane can be hidden by selecting the arrow in the lower right hand corner.